Lozère (French pronunciation: ​[lɔzɛʁ]; Occitan: Losera [luˈzeɾɔ]) is a department in the region of Occitanie in southern France near the Massif Central. It is named after Mont Lozère. Lozère was created in 1790 during the French Revolution, when the whole of France was divided into departments, replacing the old provinces. Lozère was formed with part of the old province of Languedoc. Les Sources and Hautes-Cèvennes were two other names proposed for this department but they were not accepted. The kinds of cheese that are most esteemed at Rome, where the various good things of all nations are to be judged of by comparison, are those that come from the provinces of Nemausus, and more especially the area[N 1] there of Lesura and Gabalis (Lozère and Gévaudan); but its excellence is only very short-lived, and it must be eaten while it is fresh. During the period 1764-67, the Beast of Gévaudan, a creature believed to be a wolf, terrorized the general area in the Margeride Mountains of the former province of Gévaudan (nearly identical with the modern Lozère department). 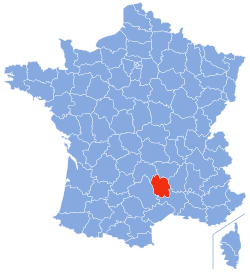 Lozère has an area of 5,166.9 km2 (1,995 sq mi). It is the northernmost department of the current Occitanie region and is surrounded by 5 departments belonging to 2 regions: Cantal, Haute-Loire and Ardèche departments of the Auvergne-Rhône-Alpes region, and Gard and Aveyron departments of the Occitanie region. The geography of Lozère is complicated, covering four mountain ranges. In the north-west, the basalt plateau of Aubrac rises between 1,000 and 1,450 m (3,280 and 4,760 ft), with a cold humid climate influenced by the Atlantic. The north and north-east of the department contains the Margeride mountains, which are formed of granite, and have peaks between 1,000 and 1,550 m (3,280 and 5,090 ft). The climate here is also cold, but drier than in Aubrac, with less snow. The Causses are a series of very dry limestone plateaus in the south-west, and the south-east contains the Cévennes, which include the highest point in the department, the granite Mont Lozère at 1,702 m (5,584 ft). The department also contains numerous rivers, above and below ground, including the Tarn, whose source is on Mont Lozère, and which flows through the Gorges du Tarn in the Causses. The département is managed by the General Council of Lozère in Mende. As of 2015[update], the President of the Council is Sophie Pantel. Lozère is part of the region of Occitanie. There are 2 arrondissements, 13 cantons and 158 communes in Lozère. The main activities are cattle farming and tourism. There is barely any agricultural farming in Lozère due to poor soil quality. The hardy Aubrac is the most commonly farmed cattle breed here. The region has one of the lowest rates of unemployment in France, which may be attributed to the enforced long-standing tradition whereby young people emigrate to cities such as Lyon, Marseille, Montpellier when they reach working age. Cereals field near Les Bondons, dominated by the hills called Puechs des Bondons. Lozère is the least populated French department. It has a population, in 2016, of 76,422, for a population density of 14.8 inhabitants/km2. The arrondissement of Mende, with 63,613 inhabitants, is by far the largest. The other arrondissement, Florac, has 13,276 inhabitants. The only important town is Mende with 11,908 people living there in 2012. 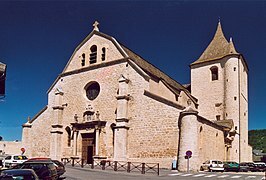 Other cities are Marvejols (4,950) and Saint-Chély-d'Apcher (4,187). The inhabitants of Lozère are known, in French, as Lozériens (women: Lozériennes). Tourist activities include caving and a variety of sports, such as skiing and kayaking. 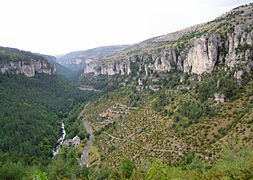 Lozère contains a part of the Cévennes National Park. Lozère is considered one of the best areas in France for trout fishing. Rivers such as the Lot, Tarn and Truyère are particularly noted for their trout populations. ^ Pliny's term is pagus, a Latin equivalent of pays. ^ a b "Département de La Lozère (48) - Résumé statistique". Publications et statistiques pour la France ou les régions (in French). Institut national de la statistique et des études économiques - INSEE. Retrieved 18 August 2015. ^ "Historique de la Lozère". Le SPLAF (in French). Retrieved 18 August 2015. ^ Pliny, Naturalis Historia book XI, ch 97:200-202. ^ "Département de La Lozère (48)" (in French). Institut national de la statistique et des études économiques - INSEE. Retrieved 18 August 2015. ^ a b c "Populations lègales 2012 - 48-Lozère". Populations légales 2012 des départements et des collectivités d'outre-mer (in French). Institut national de la statistique et des études économiques - INSEE. Retrieved 18 August 2015. ^ "Décret n° 2014-245 du 25 février 2014 portant délimitation des cantons dans le département de la Lozère" (in French). Légifrance.gouv.fr. Retrieved 18 August 2015. ^ "Lozère (48)" (in French). habitants.fr. Retrieved 18 August 2015. Wikimedia Commons has media related to Lozère. 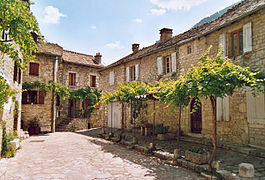 Wikivoyage has a travel guide for Lozère.